Greece has more than 200 inhabited islands, many of which are huge attractions for tourists. The beautiful landscapes and beaches along with the clear blue water can explain easily why the tourists skip the mainland and head to the small islands. The following is a list of the most popular islands in Greece. The largest and most populous of the Greek islands. It forms a significant part of the economy and cultural heritage of Greece while retaining its own local cultural traits. Crete was once the center of the Minoan civilization (2700–1420 BC), which is currently regarded as the earliest recorded civilization in Europe. From a touristic point of view, you can find touristy resorts, wonderful old towns like Chania and Rethymno, amazing deserted beaches (if you look hard enough), quiet mountain villages, and wonderful local food. Located about 200 km (120 mi) southeast from Greece’s mainland, Santorini has breathtaking volcanic views, amazing beaches and beautiful sunsets. Fira, the capital of Santorini, is located on the edge of the 400 meter (1,300 ft) high sea cliffs offering fantastic views. The island attracts tourists all year long but especially in the summer. Rhodes is one of the earliest holiday destinations in Greece. It was once the home to one of the seven wonders of the world – the ‘Colossus’. The island is named after the wonderful Medieval old town that was built on it – which is a UNESCO world heritage site. There is plenty of sightseeing to do such as The Acropolis of Lindos and the Ruins of Kameiros. The city of Rhodes also offers a lively night life. There are around 10,000 inhabitants in the island, most of whom live in the largest town, Mykonos, which lies on the west coast. Tourism is a major industry for those inhabitants, and Mykonos is particularly renowned for its cosmopolitan nightlife and beautiful beaches. Many international celebrities visit the island every summer. The second largest of the Ionian Islands. The old town with the two fortresses is a UNESCO world cultural heritage site. The island is also known for its beautiful natural landscape and fine beaches. Also known as Zante, this island lies in the Ionian Sea. It is the third largest of the Ionian Islands. The island is named after Zakynthos, the son of a legendary Arcadian chief Dardanus. Zakynthos has a thriving tourism industry. Just an hour and fifteen minutes from Piraeus, Hydra has a unique beautiful architecture. 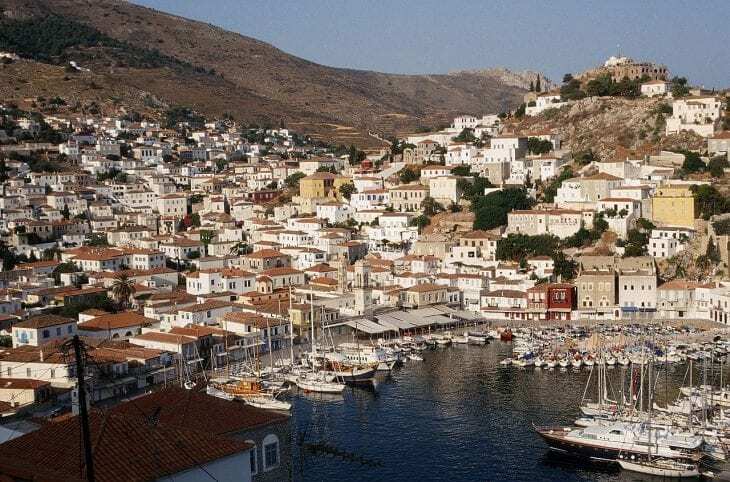 There is one main town, known simply as “Hydra port” with a population of less than 2,000 people. It consists of a crescent-shaped harbor, around which is centered a strand of restaurants, shops, markets, and galleries that cater to tourists and locals. Steep stone streets lead up and outwards from the harbor area and most of the residents’ houses and hotels are located on these streets. All motor vehicles are banned from this island with the exception of Rubbish trucks. Donkeys, bicycles, and water taxis provide public transportation. Historically, Paros was known for its fine white marble. Today, abandoned marble quarries and mines can be found on the island, but Paros is primarily known as a popular tourist spot. The beaches, the nightlife and the accommodation are known world wide and many tourists return year after year. Parikia is the capital and the port of Paros, but most nightlife is concentrated in Naousa. The island of Skiathos is filled with pine trees that reach the sea and surround its numerous sandy beaches, like the famous Koukounaries beach. The capital of the island is Skiathos, a village with red-roofed white houses built on a hillside around the harbor. Skiathos is ideal for a nice relaxed vacation. A hilly island with cliffs down to the sea on most sides, situated halfway between Naxos and Santorini. It is about 18 km (11 mi) long and 10 km (6 mi) wide. The capital of the island is Chora, a white and very picturesque cycladic village, full of stairs and narrow paths that make it inaccessible for cars of any kind. Today, the main path through this village is completely taken over by tourism in terms of restaurants, boutiques, bars and clubs. Apart from the port and the village of Chora, Ios has only a few small settlements, just a group of spread out houses in the background of major beaches.